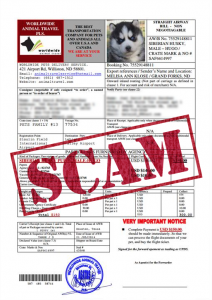 If you’re searching for a pet online, then you could fall victim to pet scammers. With more and more victims falling prey to online pet scammers, Worldwide Animal Travel wants to make sure you know how to protect yourself. Knowledge is power, so if you have heard about an incredible deal or been offered a free puppy or other pet and asked to send money via Western Union for shipping, please know that it’s a scam. With almost two decades of experience in the pet travel industry, we receive emails and phone calls multiple times a day from people who have heard about an offer from us for free pets. We do not offer free pets! Pet scammers will say anything to grab your attention and your money. These criminals have used our logo and even our name to legitimize their scam of a free pet if you pay the shipping. Unfortunately, there is no pet, and there never was – they just want your money! Do not fall victim to this scam! We are not associated with this business. We are a Canadian company; we do not have offices outside of Canada. Please ensure you review all documentation thoroughly when receiving a quote. All payments are processed at our head office, so if you are asked to remit payment anywhere else, it’s a scam. At WorldWide Animal Travel, we only send emails from @animaltravel.com. If you see an email from animal-travel@hotmail.com or animaltravel@gmail.com, it is not coming from us. Make sure your pet shipper is a member of IPATA. Know that purebred animals are NEVER free! If they ask for any sort of prepaid payment (e.g. Western Union, Visa/Mastercard gift cards, MoneyGram, cashier’s check, money order, etc. ), it is a scam. Non-refundable forms of payment are generally not required by any reputable pet shipping company. Be alert if they are telling you there is a “change reservation” fee. Make sure you ask them where their facility is located. If they are unwilling to give you their address or a meeting location, it’s a scam. We recommend arming yourself with knowledge by checking in on pet scam alerts or visiting the governing body for pet shipping (IPATA), who lists legitimate pet relocation companies. Then, call the company to verify that they are in fact making a claim for this free shipping of an animal. Do your homework and keep your money safe!